Madhya Pradesh fast bowler Ishwar Pandey reacted to his maiden call-up to the India squad for the New Zealand tour by saying he was not expecting to be picked for both formats. Pandey's inclusion in place of Pragyan Ojha was the only change in the 17-man squad for the two Tests in February. "I was hopeful but I wasn't expecting to be picked for both the ODI and the Test sides," Pandey told ESPNcricinfo. "Mazaa aayega [It will be fun] (in New Zealand). I would credit both my domestic performances and my tour of South Africa with the A side." Pandey, who topped the wicket-takers' list in the 2012-13 Ranji Trophy, has played 12 first-class matches this season - two each against South Africa A and West Indies A, and eight in the Ranji Trophy. He has taken 45 wickets in those, with two five-fors, including 11 wickets on the tour of South Africa. Karnataka allrounder Stuart Binny was included for the ODIs, along with Varun Aaron who made a comeback to the international squad after more than two years. In 53 first-class matches so far, Binny has scored 2714 runs at an average of 34.79 and has 79 wickets at 32.16. In List A matches, Binny has 669 runs at 22.30 and 37 wickets at 36.64. Binny was a part of the Under-19 World Cup-winning squad in 2000 and has replaced his then team-mate Yuvraj Singh for the ODIs. But he appreciates the long wait for the call-up. "I think back then  I wasn't ready for international cricket. But now after some consistent performances in the domestic circuit, I feel more confident about playing international cricket," Binny said. "When I made my India U-19 debut, the first tour we had was of New Zealand back then," he said. "It's funny that my first trip with the senior team is also to same country. Having toured with the India A team to South Africa earlier this year also helped. 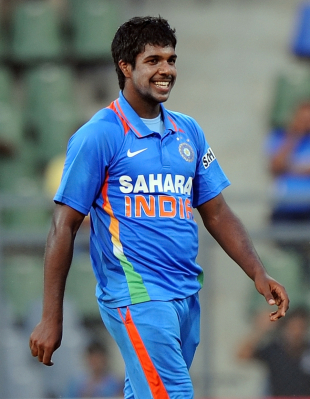 There were at least seven-eight players of the current India team who were there. They helped me get used to rigours of international cricket." Aaron has top-level experience - he played four ODIs in 2011 - but injuries have kept him out of the international circuit since then. He is playing his sixth first-class game this Ranji season and said he was "relieved" to be back in the India squad. "It is a relief and I'm very happy to be back after a couple of years so I'm looking forward to it," Aaron said. "I wasn't thinking about selection at all. I was just taking it game-by-game and I just wanted to prove my fitness and bowl well. That was my only aim and concern"
After playing the IPL in 2012, Aaron suffered the recurrence of a back injury that kept him out until the beginning of the domestic season this year. "My back feels good and after playing six games, I still feel good as I've bowled a lot of overs so I really feel confident when it comes to my fitness," he said. He underwent surgery in March this year, and a slight adjustment in his action has also helped him reduce the stress on his back. "It's not much of a change, just a slight adjustment I've made to my back foot, it's still a work in progress. My back foot has opened up, it was very straight before and it now faces fine leg instead of facing the keeper earlier. So now it's opened up, which reduces the stress on my back." "My upper half was very side-on and my lower half was a little front-on so it caused a lot of rotation. But opening my back foot eases out the stress." With the inclusion of Pandey and Aaron in the ODI squad, Mohit Sharma and Umesh Yadav were the two pacers to be left out for the five-match series that begins on January 19 in Napier.